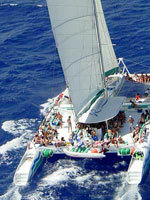 This beautiful 82' French-built sailing catamaran is the largest catamaran in the Riviera Maya. Although built for 120 people, we limit the trips to 93 people so there is plenty of room to stretch out and enjoy. This boat features huge luxurious netting up front to maximize your sailing pleasure. There are shaded areas and restrooms on board, and a full English-speaking crew delivers an excellent service for you all day or evening long. This boat is available for sunset cruises, snorkeling trips or its most popular itinerary is to sail to the Tulum Mayan Ruins, where you can take magnificent photographs from the water and take a guided tour. There are a variety of options available, including all-you-can-drink open bar, food, and guided tours of Tulum. Trips of 4 hours or more can enjoy snorkeling on coral reefs, and all trips include sailing on the clear blue waters of the Caribbean Sea. Plan your own custom experience or choose from our variety of suggested itineraries. Sail above clear blue waters, snorkel on the famed Great Mayan Reef, bask in the warm sunshine as the cool waters splash quietly beneath you. Even explore Mayan temples! The sky is the limit for your group's experience! Duration: Your Choice! As Little as 2 Hour up to as Many as 6 Hours! See the suggested itineraries below to make the right choice for your group. Departs: Marina Puerto Aventuras, about 15 minutes from downtown Playa del Carmen. Exact directions will accompany your confirmation. Pick-up and Drop-off at your Hotel is available for approximately $10.00 per person depending on the location of your hotel and number of people. Tulum by Catamaran Option: With this 6+ hour option, the catamaran will sail to the Mayan Ruins of Tulum. You will enjoy snorkeling on a coral reef and visit to a nearby beach. There are great photo opportunities of the ruins. Return to the marina is by bus, as it would take too long to sail back from Tulum. If this option is chosen, add $7.00 per person for Tulum entrance fees and guides and $4.00 per person for docking fees. See the public version of this tour. Kids: All ages welcome. Kids under 6 years old are free for the food & drinks options. Kids 6-11 years are half-price. Kids pay as adults for transportation. Notes: There is a mandatory $4.00 per person gratuity for all trips that is paid prior to the trip. You won't need to tip the tour guides after the trip unless you want to give them more than $4.00. The boat can take up to 120 people, but the insurance only covers 93 people so we recommend to keep it to 93 or less. Plenty of room to stretch out for sure! Use the navigation bar at left to browse our selection of other Playa del Carmen Tours and Excursions.